A few haven't returned all the way to the original pre-speculation price points (like the example above - butter) but in many cases the drop has been pretty complete. The movement hasn't finished yet though. That first spike was the activity of a reasonable amount of speculators - the early birds. I don't think we've seen the last of the excitement yet. Theoretically, investors who were happy to buy up at previous prices will do so again. I would be surprised if many of them held onto their stock in fact during the market peaks. Better to sell and wait for the slump (now) then buy in again. So keep your eyes peeled - I know I will. Anything could set it off. It's a beautiful reactive system. One group or individual may buy up great quantities of eggs. Another might take a shine to chocolate again. It could be any (or all) of the items that last spiked. Also keep an eye on the main site. As soon as content starts to leak or be released about the Wintersday content expect price rises as more players learn of the content to come (believe me some don't know there's a 'windersday' on the way). We've got a week and 4 days in which to enjoy the market manipulations we're seeing. Learn from the one just past - buy when low and sell when excitement builds. I keep saying this but it's advice that I've yet to see contradicted: most of the market spikes will be highest BEFORE the content is released. Not after. Once the event starts we may have another tiered content release like Halloween and the Karka event. That's likely in fact though, until more information drops, we can't know for certain. The event runs for 3 weeks so it's going to be a busy market - great fun! And finally - because I hope you all did well - did you guys make out like bandits during the last market spike? Are there any items you maybe didn't get in on and want to stock up on now? I have to say, i would like to buy some more Eggs, but I know they are already tons of people with thousands of eggs banked.. so, when they rise.. they will be thousands of eggs being unloaded and I dont think I can profit of it anymore.. what do you think? And not only eggs.. I think this round, we have more powerbuyers as in the halloween event.. how this will affect the market when the time does come and all this hoarders unload the thousands of items they banked? For more speculation, what about glacial shards, lodestones, etc?.. I mean, they are GLACIAL.. so ice/Cold/winter items? may they rise? For myself i almost invested all my gold on different items, so I dont have much gold left to invest.. smart move? I dunno.. I mean, the moment we discover more, and if we are quick to buy stuff before it gets more expensive.. I will not have the gold to make the move.. sadly. I can only hope that what I already buyed will give some better coins in return. It's difficult to predict how much stock is held in reserve but clever investors should probably be looking to buy again after selling at the previous peaks. Your last paragraph is real important - almost worthy of a post in itself! It's one of the first lessons you learn when investing you need free cash to react to interesting possibilities and market changes. Because of all the spikes we saw i listed all my Christmas investments for prices I WANT TO HAVE for them. I'm not 24/7 online so there is no chance of reacting to spikes, just list it and hope someone trys to push prices. And by doing that you avoid to be undercut by unloading people. Yah, I think Mint is due for a large spike come Wintersday. 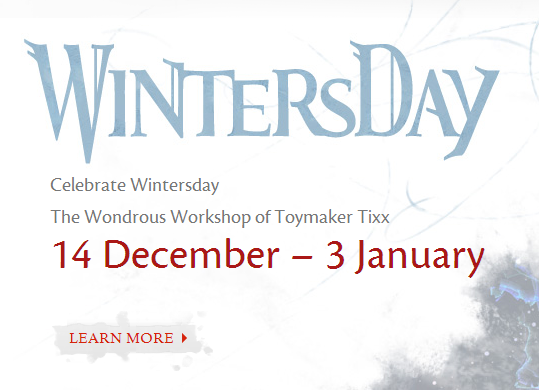 I was checking out the Guild Wars 1 Wintersday wiki page and that event was all about the candy canes and gingerbread. The demand for Mint right now is double the supply, but there is still a big disparity between the sell and buy prices. My only fear would be them NOT releasing a recipe that involves Mint and simply have the candy cane shards drop from mobs. LOL...I am thinking of eggs for sure over easter. I'll let them cheapen up though. The question is will there be a big easter thing, if they didn't do a major Thanksgiving event, maybe easter won't be huge either. Thanksgiving is a predominantly American holiday whereas Easter is celebrated in many western countries as a religeous event. Painting eggs is also, predominantly an American tradition. However, I am sure some sort of Easter themed event will be in Guild Wars 2. - The opportunity for ArenaNet to sell Skins, chests and minipets is too big for them to miss out on. Glacial Lodestones I think make sense. There isn't a great deal of rare mats that are at least winter related. I am personally investing in some cores and lodestones. Glacial Shards spiked hard today, from 7s to 18s.. I only buyed a small bunch yesterady and put some up there.. not being sold. Shards is a slow market I think.. it comes in buy waves, nothing thats benig buyed in a regular basis. I may be wrong. but what do you think about the glacial lodestones? Personally, I think cores are a better investment. Because if lodestones spike (lets say in theory to 1g), you're only looking at doubling ur investment. But if thats the case, cores will go up to atleast 40s (because ppl will look at cheaper ways to get lodestones, hence they trade in their skillpoints). 5s->40s is a much bigger ROI then 40s->1g. In theory ofcourse. But to see this phenomenon, look at charged cores for example. Rule of thumb has cores at slightly less than half of a lodestone price. So if lodestones do get up to 1g, than cores will go to 40s. Just my thought guys. Please feel free to chim in. speaking of eggs they are on the move up again. Now at 55c. Also black pepper is moving up! what do you guys think will spike next? How do you feel about chocolate bars? they are about 66c now is it worth to invest again? Specifically low priced dyes - reds & whites to dress like Santa Claus and the Polar Bear mini pet - the quintessential Christmas Animal?